Recently baubles has lost its original meaning of a friendship bracelet. Now in Russia it is rather stylish and original accessory that can be worn by anyone regardless of gender and age. However, according to the tradition of homemade baubles given as a token of friendship – the owner of baubles should tie it on the hand of his friend, then she will bring good luck. Of course, the most spectacular and memorable – it's baubles with a name. To weave this bracelet is simple, this art is available to any novice, you only need to remember a few simple rules. There are two types of netting – direct and oblique, which are reproduced on the string or frame. They differ from each other as the resulting pattern, and method of tying knots. Crooked weaving easier and to begin to learn to weave baubles better with it. Cut an even number of threads with length of 4 times the size of the planned baubles (don't forget that it should tie, that is better to leave long ends). The average is 100 – 120 cm. All the threads tie up in a single weak knot and secure with a safety pin for any suitable object such as a pillow. This will prevent the thread from twisting. Take the leftmost thread and tie it all subsequent threads. 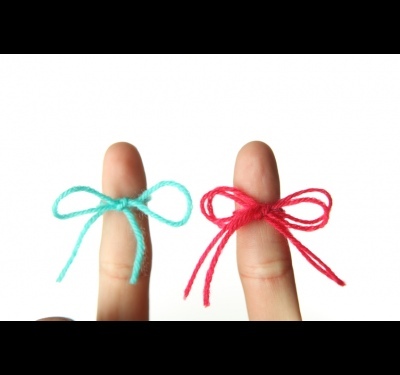 The knot is the usual – take the thread and tie a knot in it on the next thread, so they swapped. And so on to edge – you will get a diagonal strip of knots of the thread of the same color. It is important not to twist them and tighten the knots. Further left was the thread of a different color, take it and do the same and so until then, until all strings are not knit in, i.e. 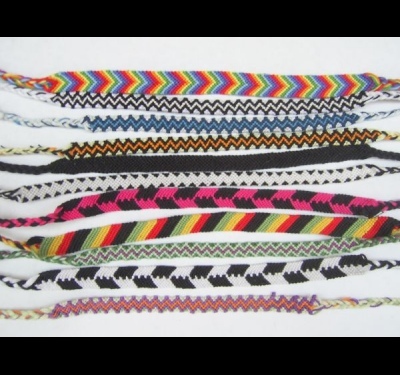 if you got 4 colors, then you should get 4 multicolored Chevron stripes. Next, the same operations are repeated until then, until the string acquires the required length. It is also possible to reverse weave. 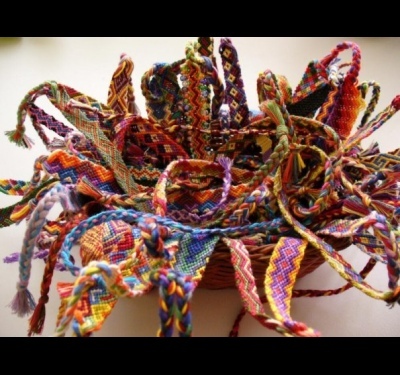 If now the knots were braided from left to right, the reverse weave all the same is done only from right to left. These netting can be alternated – the result is a zigzag pattern. However, to make friendship bracelets with the name you need to master netting direct. Direct weaving differs from curve not only pattern, but also by way of tying knots. If crooked, you tied with a simple knot, the knot should be a double. It tied so that pulling it off the thread jumped on plateau, then passed into the formed loop and immediately fit another of the same knot. Both tight knot tightened. When knit in a number, the same thread weaves the knots in the opposite direction, they are tied in mirror image. The rows should be straight. The letters weave a thread of a different color. The knots in this knot in the opposite direction, i.e. if the main color you weave a number of to the right knots for the letter should promazyvaetsya flavou side. For weaving baubles with a name or use two colors, one primary background color and the second color of the letters. The length of the lines of the ground color should be several times greater than the bracelet, you can take a coil. For convenience, it can be wound into a ball. 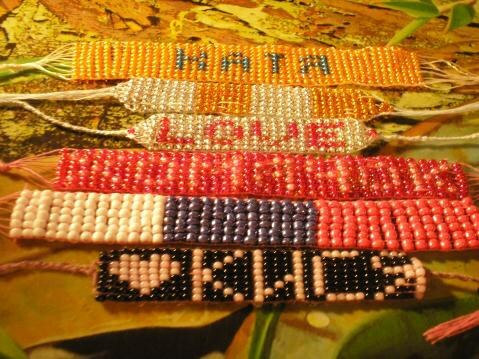 Personalized bracelets - the best memorable gift that one friend can give another. Having made this bracelet with my own hands and giving it to a friend, you can be sure that this thing will be appreciated especially, as it keeps the warmth of your hands and you put baubles in your creative power. Cut eight strands of embroidery floss the same length same color, which will be woven the letters and then cut five strands the same length of the other background colors. One of these threads should be longer than the others – this thread will be the main. To this thread enough for all the beaded baubles you can use the whole skein, not cutting it. Put threads in the correct order – the left should be two background threads, then all eight threads of a different color, again to the right two background threads, plus the long working thread. The ends of the threads tie in a knot and secure with a pin. Start to wind the yarn from right to left, the working thread simple knots. Dawasa to the left side, continue to knit the next row, tying the threads from left to right. Repeat these steps until until you build the desired length of the background fabric. In contrast to the usual baubles line knots in this technique of weaving lies not on the diagonal, and exactly horizontally. Now start to weave the letters of the name – for convenience, you may draw a diagram to distribute the knots that make up the letters, in length and width baubles. Make working thread the number of knots to the right and then stop at one of the knots and make thread of a different color node on the main thread, directing the node to the opposite left side. Thus, following the location of the nodules of the letters in the diagram, weave the first row of the first letter. Knots in a contrasting thread, which you knit letters, should always go against the direction of the nodules of the working thread. If a working thread knit right to left nodules, nodules of the letter should be sent from left to right and Vice versa. Firmly tighten the knots, make them neat and identical to the letters turned out smooth and beautiful. Finishing weave name, weave some more rows of the background color of the working yarn and complete the weaving. Bracelet with the name - original and exclusive decoration, and made with your own hands, it is doubly expensive. 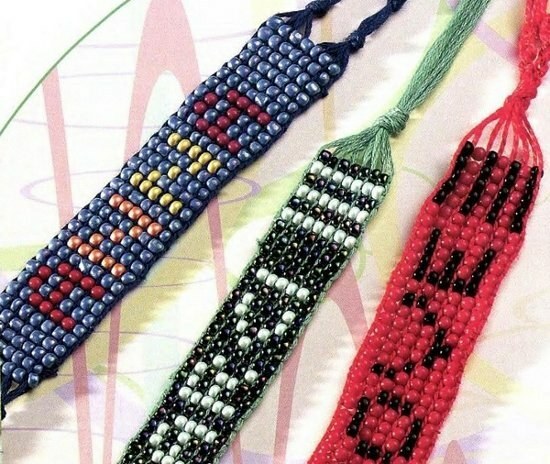 There are several ways of weaving beaded bracelets with the name, the most simple - cross method and textile. Make a diagram of the weave of the future bracelet. On the sheet in a cage, draw a rectangle with the number of cells which must be equal to the number of beads in the bracelet. Fill in the cells for a schematic image of the letters with a Sharpie of a contrasting color. Calibrate beads. Pick up a bead the same size with a rather large hole, so that through him could pass freely waxed thread or fishing line. Put on shades in different capacities. One of the simplest ways of weaving bracelet with cross. Fold the waxed thread (fishing line) in half and string on her 4 beads. In the most extreme bead thread the second end of the thread and tighten it into the ring. Then string on the left end of the 2 beads and the right one the bead of the base color. Thread the right end of the thread through the second bead from the left side and tighten. Braid thus to the required length. Next, braid the scheme, stringing in the right place the beads in a contrasting color for forming the letters of the name according to your scheme. 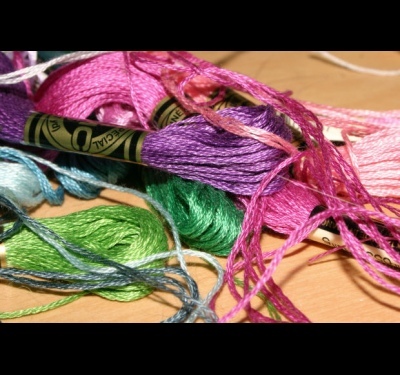 To make a wider bracelet, string on one thread 3 beads, miss the second end through the third bead. The result is that both ends of the thread out of the side beads of the first row. Then string on the right side of the thread 2 beads, and the left - 1, thread the right end of the thread to the left, that is, in the result, the parties swapped. Then pull the thread through the side beads of the first row and tighten. String on the right and on the left side of the thread on one bead. Pull the right end through the left bead and the lateral bead of the first row, tighten the thread. Continue to braid until the desired length is similar to this scheme, changing the beads where necessary. To make the bracelet with the name by way of textile, you need to first make a special machine. Decoration made with it, you get neat and smooth, in addition, your work will be accelerated several times. You can use the cardboard box, the edges of which attach dressmaker pins. To them tie the warp threads, which should be one more than the number of beads in the ornament. Pull the warp threads are not too tight but not too loose (threads should not SAG). Cut the waxed thread (or fishing line). String on it the required number of beads according to your scheme through the ranks. Secure the end of the thread with beads on the extreme warp on the loom on the left side. Spin a number, holding thread with beads horizontally across a single warp yarn, the first needle is located above, then under the base and so on. A number of unfold and do the following in the opposite direction, that is, the string to thread the beads and thread through the warp threads, as described above. Braid this way until the required length of the bracelet attach the last bead. The warp threads, remove the pins from both sides of the machine. All the strings fold together and tie a single knot. 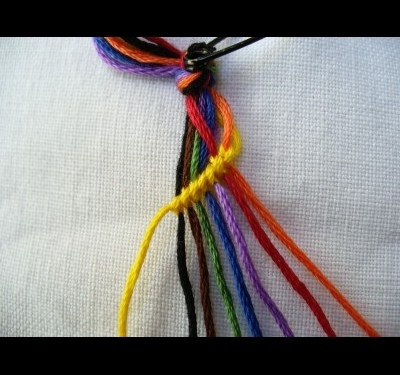 To make drawstring, split the thread into 3 equal parts braid a regular braid on each side of the bracelet. Make another knot at the ends of the drawstring.